Hey everyone! 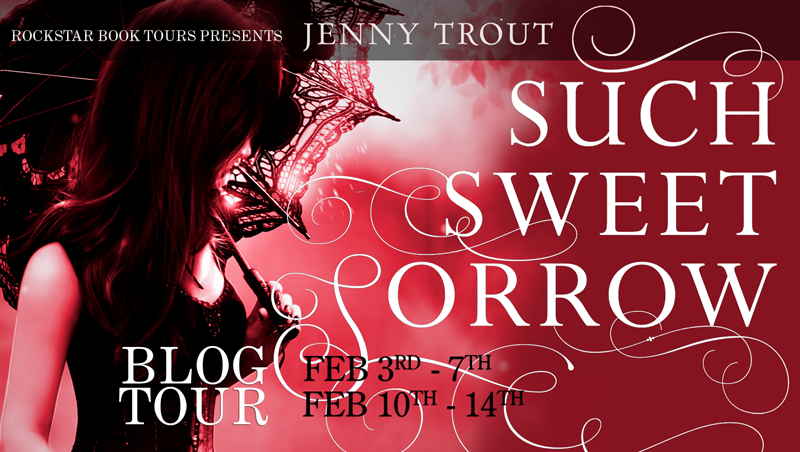 We are totally stoked to announce a new tour for SUCH SWEET SORROW by Jenny Trout which releases on February 4th 2014. The tour runs for two weeks - February 3rd- 7th and 10th-14th - and will have one or two stops per day. This tour will have a mix of reviews, guest posts, and interviews. We are so unbelievably thrilled to be hosting this tour for Jenny's book SUCH SWEET SORROW and we cannot wait for its release this February! Never was there a tale of more woe than this of Juliet and her Romeo…But true love never dies. Though they’re parted by the veil between the world of mortals and the land of the dead, Romeo believes he can restore Juliet to life, but he’ll have to travel to the underworld with a thoroughly infuriating guide. Hamlet, Prince of Denmark, may not have inherited his father’s crown, but the murdered king left his son a much more important responsibility—a portal to the Afterjord, where the souls of the dead reside. When the determined Romeo asks for help traversing the treacherous Afterjord, Hamlet sees an opportunity for adventure, and the chance to avenge his father’s death.